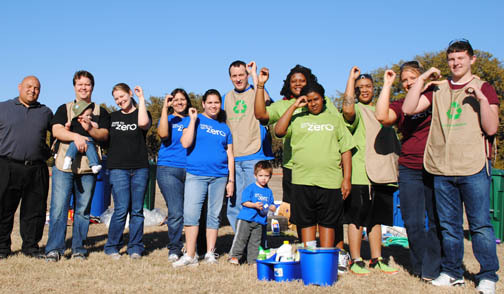 Left to Right: Dare to Go Zero Host Michael Bocanegra; Jason and Will Brian (baby) and Julia Zimmerman; Elisa, Kathy, Joseph and Konnar Barnes; Cassandra Johnson, Martaeyah Walker and Ashley Tompkins; and Tami and Triston Kyle. As part of the Solid Waste Services Department’s Zero Waste Strategic Plan to reduce the amount of waste sent to landfills by 20 percent in 2012 and 90 percent by 2040, a reality-based show, ‘Dare to Go Zero,’ is scheduled to air in late April. The City of Austin currently diverts about 39 percent of waste from area landfills.. The show features families who compete in challenges over a five week period and learn how to reduce the amount of waste they generate. Out of the 52 family applicants, eight were chosen for on-camera auditions and the four family contestants picked for the show were recently introduced by Solid Waste Services. The Barnes family – Joseph and Elisa and their two children Kathy and Konnar. 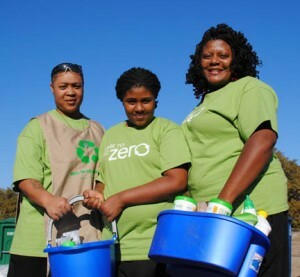 They want to teach their kids to recycle for the benefit of our planet. They also want to learn new ways of reducing waste in their home. L to R: Ashley Tompkins, Martaeyah Walker and Cassandra Johnson. The Johnson/Tompkins family – Cassandra Johnson, Ashley Tompkins and daughter Martaeyah Walker. Cassandra says she wants to participate in this show for her daughter, who cares about the environment, but Cassandra has no idea how or what to recycle. The Zimmerman/Brian family – Julia Zimmerman and Jason Brian and their son Will. With a new baby and six Chihuahuas the Zimmerman/Brian household produces a lot of waste. Jason is an avid recycler, while Julia is a work in progress. Ashley Tompkins (sorting), Martaeyah Walker and Cassandra Johnson (cheering her on). With filming already underway, The Austin Times recently spoke with members of the Johnson/Tompkins family. Cassandra Johnson said her family’s reason for wanting to participate began with her daughter Martaeyah Walker. “Martaeyah learned a lot about recycling at school so when we saw the casting call we thought it would be a lot of fun and a great learning experience for all of us.” Johnson also said her recycling awareness is already improving and her family is excited about incorporating what they’ve learned into their daily lives at work and school. The grand prize is a sustainable household package that includes up to $2,000 in energy saving improvements for the winner’s home. Episodes will air on The City of Austin’s Channel 6 and YouTube (www.youtube.com/austintexasgov) beginning in late April. 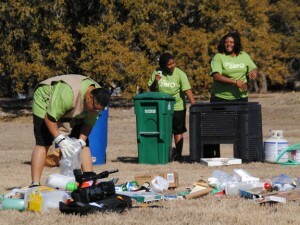 For more information, visit austinrecycles.com.